Registration Open until May 1, 2019! Offer a stipend of up to half of the cost of transportation for classes (up to $600.00). 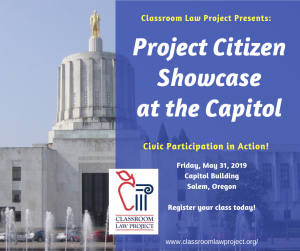 The Project Citizen Showcase at the Capitol is an annual event that brings students 6 – 12th grades to the Oregon Capitol to display and present community action projects they have completed during the year. 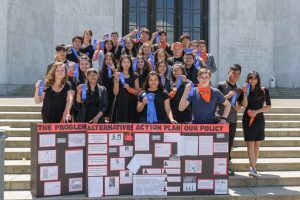 Project Citizen is an inquiry-based program that gives students the opportunity to explore gaps of policy in their community, research and discover facts, collaborate to problem solve, and come up with a solution. They create both a display of their project and a portfolio that demonstrates all of their work. At the Showcase, students present their conclusions and their project in a simulated legislative hearing to a panel of civic leaders, community members, legislators and members of the judiciary, and with fellow students observing and participating. The panel listens to the students present their work, and then asks follow up questions in a conversation about the issue and the policy that students would like to enact. All of the projects will spend time on display at the capitol where classes from other schools can observe them, and where members of the Salem Capitol community can give feedback on each project. For questions or more information, please contact Cari Zall.